Alaska became the 49th state of the United States on January 3, 1959. Alaska is on the northwest end of the North American continent, but separated from the rest of the United States Pacific coast by the Canadian province of British Columbia. The term Lower 48 has, for many years, been a common Alaskan equivalent for "contiguous United States"; today, more Alaskans use the term "Outside", though a few persons may use "Outside" to refer to any location not within Alaska. Hawaii became the 50th state of the United States on August 21, 1959. It is the southernmost and so far, the latest state to join the Union. Not part of any continent, Hawaii is located in the Pacific Ocean, about 2,200 miles (3,500 km) from North America and almost halfway to Asia. 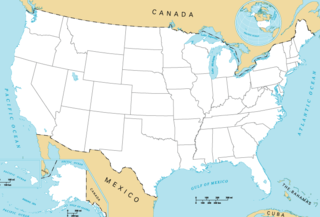 In Hawaii and overseas American territories, for instance, the terms the Mainland or U.S. Mainland are often used to refer to the contiguous United States, or Continental United States or U.S. continent in reference to the 49 states in North America.